This design makes sure that you don’t waste seed, and feed only the wild birds. That way you save money and have to refill less often. The metal mesh construction will attract clinging birds, but the ball shape means it will get wet on the rain. The same design will keep water from pooling in the container. Place the feeder in secure place with added protection from rain, the seed will get wet with this feeder. Nyjer seed will fall out so use sunflower seeds or other larger seed. The reed color make it a nice touch to add to other feeders, or by itself, and birds will see it as it stand out. The paint job appears thick enough to last for many years. This bird feeder is low maintenance as there is no special parts to clean. You can wash it easily. But as the seed can get wet, clean it each time after rain. Or place it under some cover to minimize mold and moisture. This is important as birds can get sick from eating seed that is moldy. The design will prevent water from accumulating in the mesh. This cheap bird feeder - NO/NO Red Seed Ball Wild Bird Feeder is equipped with a handle that allows it to be easily hanged. The included chain is about 10" long and has an S hook on the end. It will attract clinging birds, place larger seed to minimize spillage on the ground. Make sure it is out of the rain, that is this bird feeder only flaw, as there is no protection from water. The filler hole at the top is a press-fit metal cap which seems secure and allows a refill without having to take down the feeder. To prevent squirrels from getting to the feeder it is best to place it high, and hang it from a thin wire, the squirrels don’t like to climb such small wires as it is harder for them to grip on it. This long distance way down is a one more factor that might prevent them from sliding down. The lid that comes with a product can be removed by the squirrel if not secured more. I recommend you use duck tape or something similar to make it more resistant. The squirrels have a good grip, and can hold on to the feeder if jumped on it, it is metal so they cannot damage it by chewing, its only if the squirrel lifts the lid that the seed is eaten. If the lid id lifted and is not in place, a bird can try to enter the bird feeder and get stuck in it, so that is one more reason to secure it. What bird will come to No/No red ball bird feeder? As this is a clinging bird feeder, it is natural that clinging type of bird will come to visit this feeder. These are: black-capped chickadees, white-breasted nuthatches, and downy woodpeckers, etc. 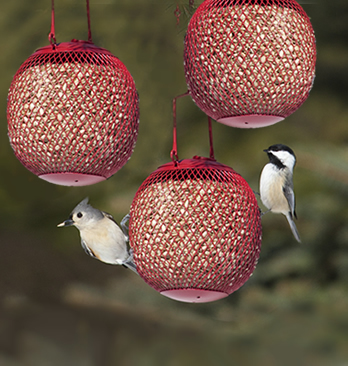 These birds will happily fly to and cling to the feeder, it can be used al year-round. Black oiled sunflower seed is the best type for this feeder. It’s a nice little feeder, if you overlook that there is no water protection, and is placed under some cover it will last for years. It is not expensive, this feeder is the best bang-for-the-buck out there. Check No/No Red Seed Ball Wild Bird Feeder here.